These theme cosmetic bags are a unique way to gift your besties! Fill them with custom lip balms, sunglasses and more (not included). Each black or white cotton canvas bag comes with a gold zipper. 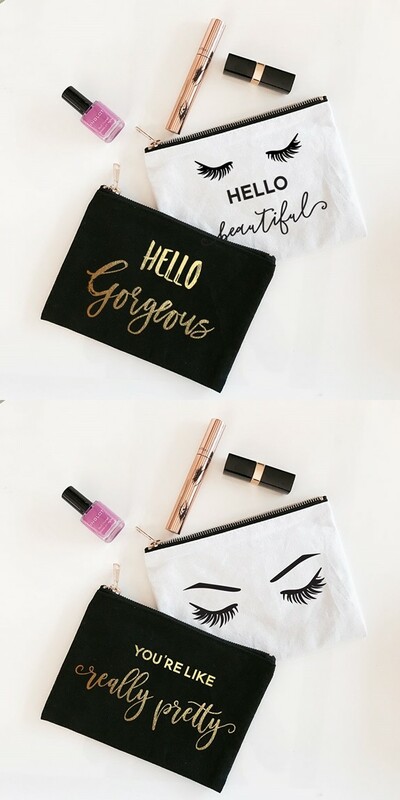 White bags are printed with a lashes design and "Hello Beautiful" in black and black cosmetic bags are printed in shiny gold foil reading "Hello Gorgeous." PLEASE NOTE: Sold individually. Pictured contents are NOT included.